Language is part of every culture and nation on this planet. It is diverse and the sounds produced are the basis of the language spoken in different countries and among different groups of people. In addition to the spoken language, there is another important aspect of communication and that is body language. It is body language that uses posture and gesture as its basic communication medium. Postures and gestures can cross language barriers, but can also be found to be specific to particular cultures. The difference between the two concepts comes in the action. A posture is a pose using the body as its communicator while a gesture is a movement made to demonstrate an idea or sentiment. 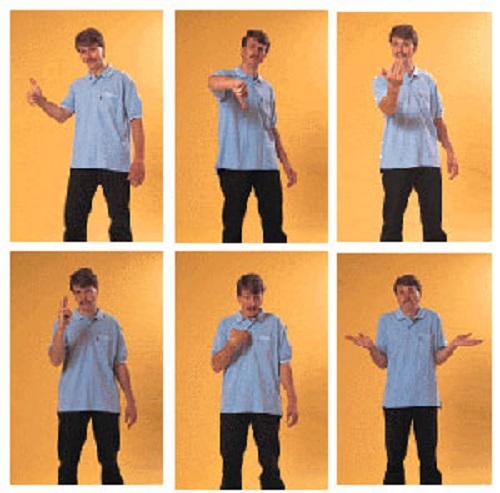 Gestures use different parts of the body while a pose makes a larger movement involving the whole body, almost statuesque, but still demonstrating a sentiment or adding meaning to the spoken word. Postures and gestures are ways that we use our bodies to make different forms of non-verbal communication. They include facial expression, hand movements, eye movements, seated and standing poses as well as arm movements, shoulders and leg stances. Both posture and gesture can signal sentiments. They can show confidence, a shy nature, assertiveness, submissive personalities, anxiety as well as aggressive dominant traits. It is thought that posture is related to the whole body, the pose which is an attempt to convey a message. Intentional or unintential there is a great deal to be learnt about people from their body language. In some societies and cultures a person’s social standing can be conveyed by their posture. A submissive person may lower their gaze or bow their head. A more confident person or someone with higher standing may have an arrogant stare and stand with hands on hips or arms folded. A pose with folded arms gives all kinds of assertive messages; it is a powerful pose. In some cultures your pose or stance in front of a dignitary is very important and could be viewed as disrespectful of you should not obey the customs of the time and the country. In some countries the masses should always be in a lower pose to the king or Emperor, even if it means lying flat on the ground to achieve such a humble posture. Posture can be categorised as open or closed and reflects emotion, attitude and intention. Closed is seen as a person guarding their space with arms folded, putting up a closed barrier with crossed legs and turning away from another person in conversation. Eyes can either be averted or a strong and challenging stare could be the mood of the pose. Open posture is softer and more forgiving and gentle. Hands are apart, arms resting in the lap or on the arms of the chair. In this form of posture there is an openness and interest in the other person, a willingness to listen. Mirroring, when couples do the same thing, is a sign of mutual admiration. It is the signals that show the interest a loving couple show in each other. The mirroring of their actions shows a special bond and approval of one another. Personal space is an important part of posture. It is called proxemics and ranges from intimate to public distance for the posture area. Many people do not like their personal space invaded and can feel claustrophobic in circumstances where their space is compromised. Mapping body posture and gestures help psychologists and other persons interested in the signals sent out by body language. People are constantly sending out messages about themselves through their posture and gestures. The skilled interviewer can learn a great deal about the candidate by their body language and that is also true in police work as the interrogator watches for the body posture and facial expressions of the suspect in the interview room. In the event of a suspect concealing their real emotions a lie detector is a useful tool to assist with the interrogation. 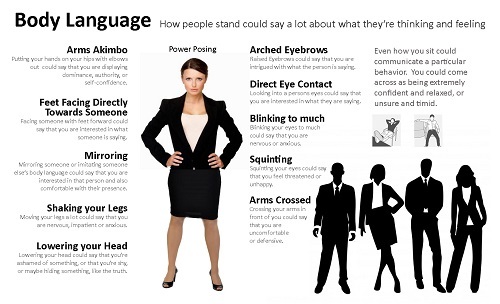 Understanding body language and the importance it plays in communication is a very valuable skill as actual speech makes up approx. 30% of communication. It is body language and gesture that forms the rest of our interaction with other people. Some languages are more demonstrative than others. It is body language and gesturing that actually starts the process of learning to understand one another. Babies and young children soon learn the early communication skills or waving, clapping and crying out for their needs. The foreigner learning a new language can resort to various gestures that have meaning across all language barriers. Gestures fall into different categories that help the skilled observer understand them and link them to their meanings. ‘Emblems’ can be used instead of a word and it is these gestures that actually cross language barriers. A hand wave, finger beckoning, thumbs up or thumbs down are all emblems, gestures that have specific meanings. Shrugging shoulders and shaking your head are also gestures that tell the observer that that are not understood and everyone can read that emblem of body language. ‘Illustrators’ are gestures that accompany words. Nodding your head and agreeing at the same time is an illustrator of agreement. Pointing a finger and giving directions at the same time is another illustrator. ‘Animal gestures’ are important in the animal kingdom. There are many gestures that can help trainers and people involved with animals understand the creatures in their care. Most people are familiar with tail wagging from dogs as a sign of enjoyment while baring teeth and snarling is a sign or gesture of aggression. The eyes in particular can offer many gestures that communicate emotions like happiness, sadness, anger, surprise, and disgust. The mouth has its share of gestures to add to the facial expressions as the expressions of happiness through a smile or anger with a churlish gesture and a saddened gesture with lips turned down. Gestures are also made with hands and in fact some people are unable to speak without using their hands to make the point of their conversation and gesticulate in explanation. It is through signing that the deaf are able to ‘hear’ and signing has become a language in its own right enabling the deaf to listen to television programmes, attend meetings and services if there is a person able to sign for their benefit. Young children learn a great deal through gestures and rhymes as they enjoy nursery rhymes that in turn teach language skills and communication. Learning to count and understand numeracy is made easier for younger learners as they learn to count fingers or to recognise numbers through knowing how many fingers are to be counted, added or subtracted. Hand gestures and ‘high fives’ are soon learnt as forms of achievement and encouragement. “I speak two languages – body and English.” Mae West. “The most important thing in communication is hearing what isn’t said!” Peter.F. Druker. Peter Druker was an economist, educator and author who saw the value of studying body language in business management education. Body language made of poses and gestures using smaller parts of the body is what makes our ability to communicate a realistic experience. It is the engaging part of our language that adds animation and makes conversation interesting. The use of body language comes naturally to most conversationalists and studying poses and gestures can be a fascinating pastime as an observant person watches these aspects of communication. Christina Wither. "The Difference between Posture and Gesture." DifferenceBetween.net. July 23, 2018 < http://www.differencebetween.net/language/the-difference-between-posture-and-gesture/ >.